The business-class SmartNode 4110 VoIP Media Gateway supports up to eight transparent phone calls and leverages VoIP for carrier and corporate access. Connecting to any analog phone, fax, or PBX, the SN4110 is an effective and flexible solution for toll-bypass, remote/branch office voice connectivity, and enhanced carrier services. The SN4110 series is the perfect choice for phone-to-IP connectivity supporting up to 8 FXS ports or a combination of 4 FXS and 2 or 4 FXO ports. With its FXS analog ports the SN4110 connects to any legacy telephone or PBX and provides dial-tone, ringing, caller-ID and other services. When equipped with FXO ports, the local PSTN can be accessed enabling local calling and enhanced toll-bypass applications while using a single connected telephone. Flexible call integration allows per-port telephone numbers, programmable call progress tones, and distinctive ringing. With Telephony-over-IP (ToIP) call switching, calls can automatically be routed to the PSTN or the IP network while providing flexible numbering plans and end-to-end feature transparency. PPPoE, DHCP, and VLAN offers universal IP connectivity and optional IPSEC VPN with AES/3DES guarantees secure voice over the public network. 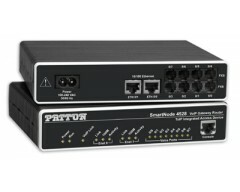 Patton's SmartNode 4110 delivers the legacy phone interfaces, service transparency, and flexible PSTN integration for true converged packet voice.